Salman Rushdie is an Indian British novelist and eassyist, best known for his works like Midnight's Children, The Satanic Verses, The Moor's Last Sigh and Harous and the Sea of Stories. 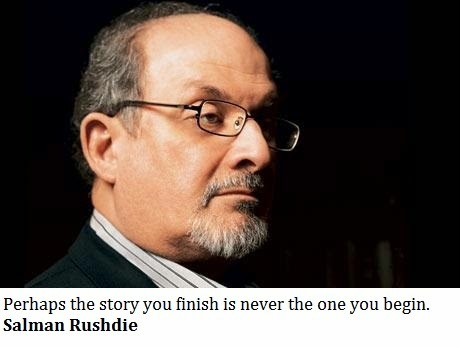 Here I have compiled down some of the best Salman Rushdie quotes, just hope you will like them. A photograph is a moral decision taken in one eighth of a second. A poet's work... to name the unnamable, to point at frauds, to take sides, start arguments, shape the world and stop it from going to sleep. A sigh isn't just a sigh. We inhale the world and breathe out meaning. While we can. While we can. From the beginning men used God to justify the unjustifiable. Fundamentalism isn't about religion, it's about power. How do you defeat terrorism? Don’t be terrorized. Language is courage: the ability to conceive a thought, to speak it, and by doing so to make it true. Masks beneath masks until suddenly the bare bloodless skull. Memory has its own special kind. It selects, eliminates, alters, exaggerates, minimizes, glorifies, and vilifies also; but in the end it creates its own reality, its heterogeneous but usually coherent version of events; and no sane human being ever trusts someone else's version more than his own. Most of what matters in our lives takes place in our absence. ?No people whose word for 'yesterday' is the same as their word for 'tomorrow' can be said to have a firm grip on the time. Not all possibilities are open to us. The world is finite; our hopes spill over its rim. Perhaps the story you finish is never the one you begin. Realism can break a writer's heart. The only people who see the whole picture,' he murmured, 'are the ones who step out of the frame. The world, somebody wrote, is the place we prove real by dying in it. To understand just one life you have to swallow the world ... do you wonder, then, that I was a heavy child? You can't judge an internal injury by the size of the hole. We all owe death a life. We are the storytelling animal. We are described into corners, and then we must describe ourselves out of corners. We crave permission openly to become our secret selves. What can't be cured must be endured. What's real and what's true aren't necessarily the same. When you throw everything up in the air anything becomes possible.